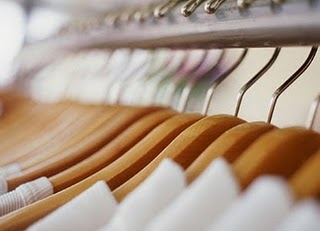 Of course organizing your closet would be a breeze if you had a custom closet organizing system. But that is not always possible. I live in a rental, so installing anything is out of the question. As much as I would LOVE one, a nice system is not an option. That leaves me with a basic bar and a shelf above it. If you know me at all, you know I am absolutely obsessed with closets. In grade school when all of my friends would doodle hearts and flowers, I was drawing closets. Yeah, I know I'm a complete dork. To me, there is something therapeutic about seeing an organized and beautiful closet. It helps me sleep better, saves me time in the morning, and just looking at it boosts my mood. So what to do? This is what you do. 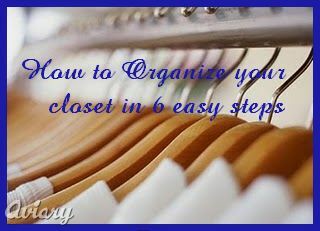 Closet organizing in 6 easy steps, 7 if you are married or sharing your closet. Get rid of wire hangers. Joan Crawford had that one right "no more wire hangers" The only positive thing about a wire hanger is it takes up minimal room. It also distorts the shape of your clothes, looks ugly, and isn't very sturdy. So step 1 is get rid of all the ugly, useless wire hangers. 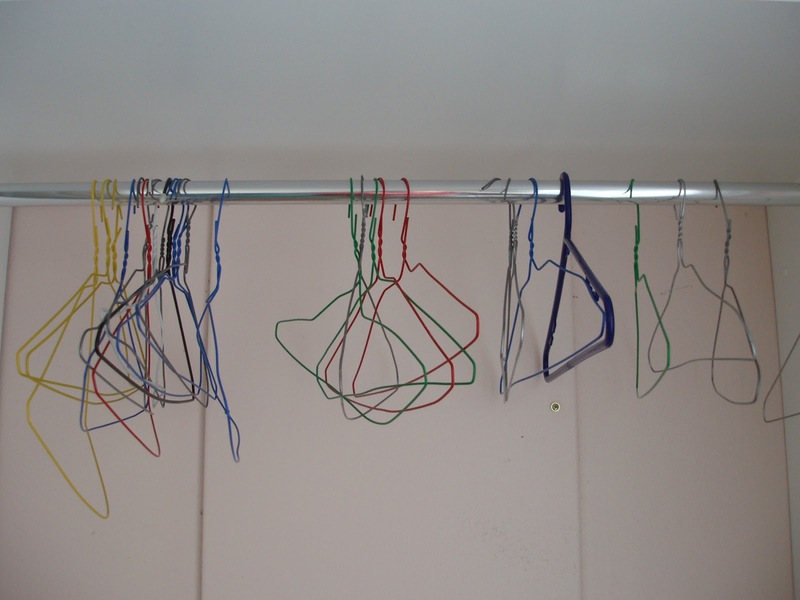 I personally use plastic hangers because they come in different colors and I can color code my closets. My closet is white, my oldest daughter is blue and my youngest is pink. Everyone has their own color hangers. I would love to have all wooden hangers but the closet for a single mom is just a little too steep right now :( but one day I will have all wooden hangers AND my fancy closet organizing system. In the mean time I make due with what I have and just adapt. Another plus to plastic hangers is that they are fairly cheap. Get rid of everything you don't wear. Some say only keep items you have worn in the last 6 months I say that isn't necessary if you still love the item and you just haven't had an occasion to wear it again. Why get rid of something because you haven't worn it only to replace it a year down the road. That is a waste of money. My philosophy is, if you don't really like it or if it doesn't fit go ahead and ditch it. There is someone that may love it. If your closet is really small like mine is you may need to pack away your out of season clothes. I always leave a few of my favorite most versatile pieces out because if you live in a place like I do the weather is seriously unpredictable for most of the year. Now that you have only the items that you love and think you will wear you are ready to begin. Group like items together. I like to sort my clothes by categories. all my work clothes are together and then all my casual items are together. (tee shirts and non dressy tanks are kept separate) If you are really fired up, you can sort them within the groups, by color :) but its not necessary. I mentioned that my tee shirts and tanks are separate. All of my tee shirts are folded with the logo facing out so at a glance I know what I am looking at, and it is placed in a drawer. My tanks are rolled up and placed in their own separate drawer. I mentioned in my about me, that I am really in love with Nine West purses. I keep all of them placed neatly on top of the shelf above my clothes. 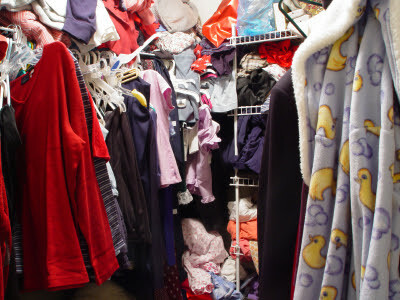 I am single and don't have to share my closet with anyone, however if you do have to share, you can always add an extra bar to the closet underneath the main bar for the shorter clothes. In my case that was my clothes. Then I would sort my husbands clothes the same as I sorted mine, by grouping like items. Doesn't this closet look so much better? I wish that I was able to take a picture of my closet for you, however it is laid out in a way that getting a picture, at least one with the quality to post, is appearing impossible.